I receive a few emails each week asking questions about cycling in the Alps. To save some effort, I thought I’d put some of the more frequently asked questions / answers here. Feel free to ask additional questions in the comments. 1. When do the Cols (passes) Open? It depends on the weather – of course. But the highest Cols usually aren’t open until early or mid-June. The following links show the status of most of the major French climbs. If links are dead, search “etat des cols + the region. Another site with Austria, France, Germany, Italy, Slovenia and Switzerland: here. As the openings approach, you can contact local tourist offices and they will often have an exact opening date. For example, for Galibier, contact the Valloire tourist office here. 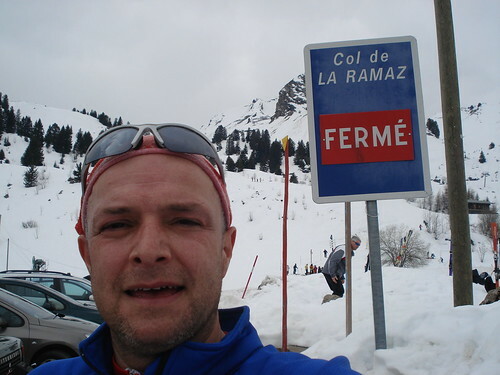 In autumn, I have climbed Galibier in late October, one year, yet in 2007 there was significant snow in September. Remember, early and late in the year to bring extra layers for the FREEZING descents. 2. Could You Recommend a Tour Route? 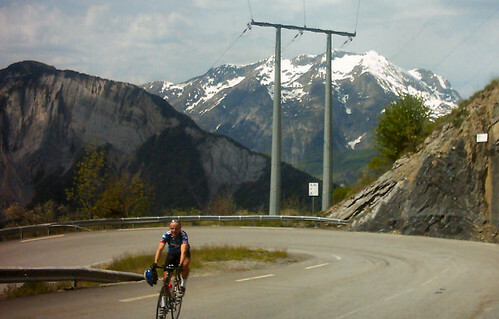 The Route des Grandes Alpes goes from Lake Geneva to the Mediterranean over most of the famous French Alps climbs. I’ve written 7 posts detailing a 7 day Tour of this great route here. The book “Cycling in the French Alps” by Paul Henderson (available at Amazon.com or Amazon.co.uk) – details 8 great multi day trips. Including the Route des Grandes Alpes mentioned above. Highly recommended. Or see the Switzerland National Routes link below. In the French Alps, Haute Savoie and Savoie have a large network of signposted routes ranging in Difficulty from Green (family), Blue (rolling), Red (difficult) to Black (Epic). You can order by mail a fabulous free package (link here) of 3 maps detailing Cols, Routes, and multi-day trip ideas. A free PDF brochure is available for download here. An online list of routes including google map with links is here. In Switzerland there are 9 National Cycling Routes that follow superb routes and are perfectly signed. Plenty of cycle friendly hotels along the routes. For more details see here. Additionally, virtually every local tourist office in France or Switzerland will have maps and details of local cycling. 4. Where should I stay to climb Alpe d’Huez? The most asked question! Most people stay in Bourg d’Oisans at the bottom. The official site is here and lists accomodations. Personally, I prefer staying up top in Alpe d’Huez. Much more scenic. 5. What Gearing Do I Need?? Generally I always suggest to people to bring easier gears than they think they need – there are many climbs 20 miles long. Even strong cyclists will appreciate a compact. Recreational cyclists unfamiliar with HUGE climbs will be absolutely miserable without proper and easy gearing – this means a triple. Macho studs will mock me and my triple (with a 27!! at back), but on long steep days, even if I am bonking, I can still turn the pedals. My wife has a huge granny gear and has conquered Galibier, Alpe d’Huez and Ventoux. 6. I am going to Alpe d’Huez / Mont Ventoux. Can I rent a road bike? For Alpe d’Huez see here. 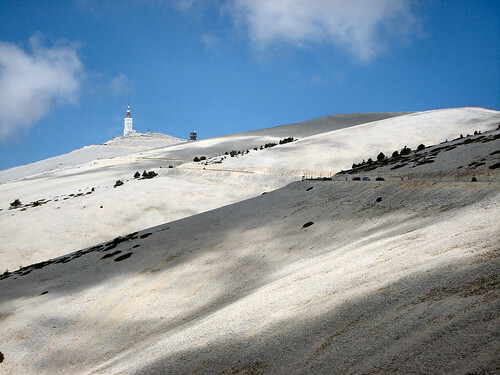 For Mont Ventoux in Bedoin, take a right turn towards Ventoux and 100 yards later on left is a huge store with rentals. 7. Where Do You Get Your Climb Details? Primarily, I use the series of books “Atlas des Col des Alpes” – by Altigraph. The series includes books on the Swiss and French Alps as well as the Juras, the Pyrenées, and the Vosges. Although in French, they are easy to understand. Basically just route directions, low quality map, and an elevation chart for pretty much every climb in each region. 8. What do the “N”, “D”, “C” mean on French Road numbers? N routes are “National” routes and usually very busy. AVOID. For example, the N201 appears the best option on a map to leave Geneva towards the Alps. It is a horrible, fast, crowded, truck-filled road. And I often see hapless cycle tourists struggling along it. Yeck. D routes are “Departmental” roads and are usually good quality and less crowded. C are “Commune” roads. Small local and almost always very quiet. Ideal. 9. Watching the Tour de France Live? First, watch in the mountains. On the flats the Peleton passes in a flash – dull. In the mountains the suffering is epic. It is so much fun to cycle up a huge climb the day of the Tour. Cyclists and Fans everywhere. Generally, the roads will be closed to non-official cars several hours before the riders arrive (even earlier for places like Alpe d’Huez). A publicity caravan passes over an hour before the riders – throwing little gifts, playing music, etc. So you need to be at the top well before this or the police will stop you. Thus you need to start climbing several hours early. Bring lots of water and food as it becomes a long day – riding then waiting for the Tour. But a memorable experience. Yes and lots of it. Just because it’s cooler up high doesn’t mean the sun isn’t very strong. I have gotten into the habit of using 30 or even 50 SPF. And on very long rides bring a little tube and reapply. Nothing worse than riding with sunburn. #5….I don’t think your answer goes far enough. So for example I would like to know, what are the best shoes for pushing a bike up long steep hills? I can personally vouch for the need for a compact. Coming from Oz, sure I could climb, but its a different ball game when it goes on (and on) for >20 km. -now what can our partners do while we take off for 5hours?! I am arriving at bourg de oisans on the 29th of May and on the 30th I want to do the marmotte loop( did i spell that right ?). I think its around 180 km I have done many climbs in Italy Zoncolan,tre cime, Mortirolo etc, I guess my question is If I get to near the top of the Galibier and its closed does that mean I will have to ride back the way I rode etc. Yes, I assume you plan to start from Bourg d’Oisans and climb Col de la Croix de Fer – if it is open – and then descend into the Maurienne valley to climb Galibier from the telegraphe side. If Galibier is closed there is no good alternative shorter than going ALL the way back up Col du Glandon that you descended (the Marmotte descends down Glandon usually I believe. 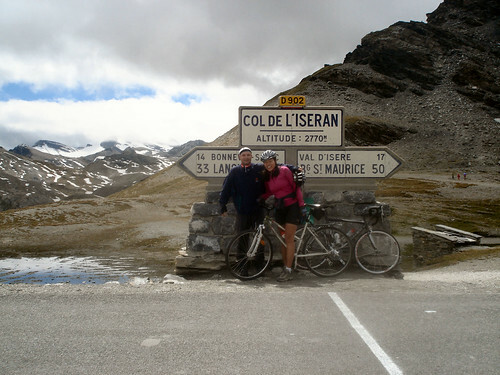 Although – you COULD return the up the North side of Croix de Fer – it starts in Saint-Jean de Maurienne. This will be in the 2008 Tour de France and would be slightly shorter than returning via Glandon. But yes, there is no short and easy alternative if Galibier is closed. as your trip approaches as they can give up to the minute advice on the Galibier opening date. Valloire is the village half way up north side of Galibier. Just a PS to previous post. Not sure if missed it but dont see much re Dolomites. Highly recommended. There is a permanent route that takes you from lake geneva to Trieste taking in some classic climbs in Switzerland and Italy along the way, including Stelvio. And it has the option of making a detour so that the last climb of all is up Zoncolan. Hi, just found your site and its been a great help. Three of us are coming over to cycle Alp D’huez and stay to see the TDF come through. We are all in our 40’s and never cycled the Alps before. Just got into cycling last year, done some training but starting to feel apprehensive now! Got a Bianchi with a triple so hopefully I’ll be ok.
Fanastic site! So much detail and love your photos. What camera and gear (tripod) do you use? What video do you recommend to capture your descents? Do you have tips on taking photos of yourself when riding on your own? 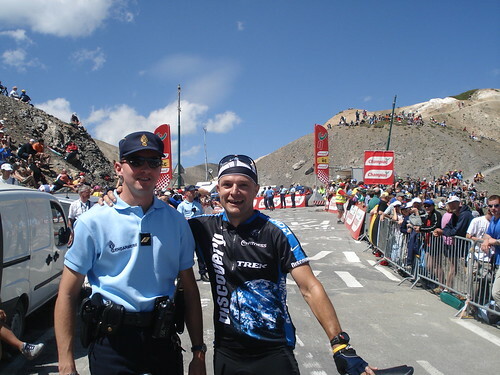 Planning to travel as 2 families to watch TDF2010 in Pyrenees. Any tips with accomodation in the Pyrenees for 2-3 weeks? I sent you a private email response. just read through your site taking notes and downloading the pdfs. Thanks alot. Myself and my brother are currently in Barca, having riden form London. Before this neither of us where cyclists, but now have a taste for it. Plan is to get ferry over to Genoa and cycle through the alps. We both have road bikes though so not sure how they’ll take to the cobbled paths plus have about 20kg on paniers. Is this a stupid idea for two, up until recetenly, cycling novices, with this amount of gear? If you, or anybody else could give us any advice or help be much appreciated. Hi! Similar query to Mark above. I am a fairly amateur cyclist riding from Le Havre in France to Pula, in Croatia in about two weeks time. We’re really keen to avoid any public transport and so the plan is to follow the D road from Grenoble to Turin, around 150 miles. Can you advise on how difficult/practical/time consuming this will be? I am trying to gauge how long we need to set aside for it, and whether we’ll actually be able to!! ps this site is brilliant! Feel free to drop me an email with specific plans. But it’s not really possible to say how easy or possible your plans are. It totally depends how strong you are. I certainly wouldn’t try a long trip in paniers over mountains unless I’d practiced a little on mountains to ensure I could do it. For some people no problem, for others maybe impossible. Do you have any recommendations of where to stay in Bedouin or nearby ? I’ll try and fly in to Nimes if that makes sense. Sorry, I have never stayed in Bédoin. I usually stay in Avignon because I enjoy the old town and the Papal palace. (without a car, Avignon is not very convenient for Ventoux). Hi there, im a complete amature, but im going to spend next summer going all over the alps with a cycle and camping gear (i expect the first week to be hell but it’ll get better) just from camping site to camping site. I dont suppose you would have a suggested route would you? or a pointer towards the best research? I will be there for a couple of months at least so i wouldnt mind a nice long slow route through the whole of the alps. Hi, Will. Great site. My husband and I are bringing our three kids – 15, 13, and 10, to Annecy in early August. We (adults) are experienced cyclists (triathlon and touring) … though can’t say we’ve ever done this much climbing. Anyway – we are assuming athletic kids make it over a few of these passes in a granny gear with frequent stops, or are we crazy? Also, want to stay in Palais de Menthon but see it may be a problem to get to start of some of these rides. Are the roads really busy on the east side of the lake? Should we consider staying elsewhere? Thanks! Oh – and I’m assuming we should rent mountain bikes for maximum flexibility though I’d rather have my road bike… . Thanks for your thoughts. On the west side of the lake, from Annecy to Albertville is a cycle path along an old railway line that runs the length of the west side of the lake. It is car free. Whereas, as you fear, the east side can have a lot of traffic, especially in summer. If I had three kids of that age that might want to play/cycle a little on their own I’d honestly strongly prefer the west side. Apart from around the lake and near Annecy, the roads/climbs are much quieter. As to MtB vs Road bike? There is plenty of road biking from Annecy, there is no “need” for a mountain bike unless you enjoy it. Love the site – fantastic info. Quick question I suspect you know the answer to. I’ll be heading to Alpe d’Huez to watch the Tour. We are staying in Alpe d’Huez but want to ride up that morning. I assume we’ll be able to (along with thousands of others)? What time do you think they’ll close the road up? I’m guessing at around 1pm assuming it finishes at around 4? Lewis, it varies climb by climb and year by year. 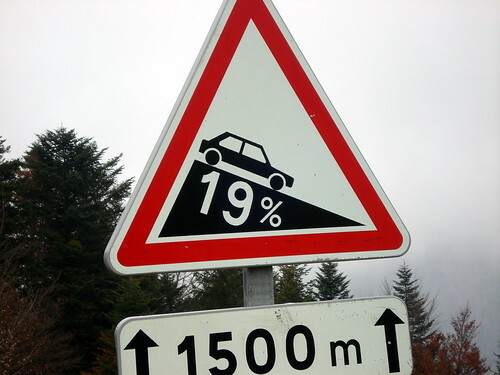 But you want to be careful on something as popular as Alpe d’Huez. It may get closed sooner than you expect. I remember watching on south side of Galibier a few years back and they closed the road above Col du Lautaret very early and everyone in our group (except me and a friend – the early risers) were unable to climb up, despite there being plenty of time. You can always try asking officials around town as they may know. But I’d want to be in my viewing place a few hours before the stage – and then just enjoy the atmosphere and caravan, etc. . Cheers Will. Havew now looked at the TdF website which is showing a scheduled arrival in Alpe d’Huez some time between 5 and 6pm so I’m hoping they will leave the road open for cyclists until at least noon which would be fine. Even so, an early start makes sense. They only leave Modane at 2:30, so that’s 100k including the Glaibier and the Alpe in 3 hours – nuts!! Just back from a sponsored cycle in the Alps with 43 others from Ireland. Raised about €180,000 for the Irish Hospice Foundation in the process. The route went from Geneva to Montmelian via Lac Bourget with four tough days in the Alps before finishing with a swim in the Med in Nice. The climbs included Glandon and Alpe d’Huez on day 2, Lauteret and Izoard in rain on day 3, Vars and Cime de Bonette on day 4 with some sharp climbs to hill towns before decending to Nice on day 5. Your site was a great source of information for me before I decided to sign up for the challenge. I assumed that you were/are super-fit so it was Doreen who gave me the confidence to go for it. The photos and description of her taking on some of the really big climbs were inspiring. Well done to you both and keep up the Col-bagging. Congrats on what sounds like a great trip. Great site, I’m already planning my holiday next August! We have done Alpe D’Huez, Col De La Columbiere and Ballon D’Alssce towing a bike trailer with my daughter in it! We now have 2 children and a double bike trailer and I think I must be towing 45KG! Not done any mountains with it and I don’t think I will. We’re probably going to get 2 single trailers. Anyway….. I was wondering if you can offer any advice on any where may be a good area to go to with children in the alps? I love Bourg D’Oisans but there’s not really anything for the kids nearby. With kids? I’d suggest somewhere on Lake Annecy. There is lots of brilliant cycling in the area. Both flat and very challenging. And there are endless activities for kids: Swimming, Tennis, fun parks, nearby town, pedalos, tennis, etc, etc. Do you know of any good caravan sites on the lake? I like pitches with hedges around them so we get privacy. There is lots of camping all around the lake. But I have never camped there. You’re best bet would be Google search. Most have english web sites. It can definitely get crowded in summer as very popular place – so I have no idea how private stuff is. How late in the year have you cycled in the pyrenees. Am thinking of riding last weekend of september. It’s impossible to predict the weather ….. it may be hot …. snow is possible. But I’d think late September has an OK chance to be fine. Dear Will, I am 66, skinny fit and I ride in Cumbrian hills most weeks, averaging 12-15mph, often for 3-5hrs per ride. I have a Kuota with compact gears. Have only ever ridden one sportive (105mi). Will I need triple gears to do the Raid Alpine in September? As I said above, it really depends how strong you are. But that event features several consecutive huge days. And it may be hot. Lacking an easy enough gear is a great way to destroy your trip. So I’d just suggest you bring easier gearing than you currently expect you’ll need. There’s virtually now downside to having a triple. And it may save your trip. A friend and i are thinking of a 4 day tour in the dolomites. We would like to include the stevilio. Where is the nearset airport and any ideas on road bike hire round there. Also any ideas on where to stay to make the most of our stay. We are both proficient riders/races so would likke to get some of the main climbs in. All my Dolomite rides were while I was staying in Bormio (base of Gavia and less famous side of stelvio) or Corvara (sella ronda). Both beyond fantastic locations. Sorry, no other suggestions though. Hi Im heading to Nice on Tuesday and spending 2 weeks folowing the alps over the great passes through france, switzerland and over to italy, Stelvio, Mortirolo and down to milan.. Gonna be camping and carrying all my gear… My route is gonna be around 88 miles per day and over 10000 ft ascent… to try and cut weight down a bit Im wondering how cold it gets at nite to see hw many long sleeve top to take and should i take winter gloves for tops… weather for Nice, geneva and milan looks hot for next 10 days.. Im hoping ill be able to do the milage as i have a plane to catch.. should be ok as my endurance is good on previous trips where iv done 120 a day for 14 straight around scotland… climbs not as long but still steep..
At night? up high? Very cool. I’d make sure to look at weather forecasts very regularly before cutting back on warm clothing even in a heat wave in August. Ide very grateful appreciate any information you could provide on the best time to go (Low season preferably) as I plan to drive over in the jeep (With bike in the back ) & stay in a chalet/campsite for 2 weeks around Briancon??. This has been a lifelong dream, but I find myself short on firm information now that I’ve set about doing it. As I said I nearly made an expensive mistake already & would appreciate any help you could offer. 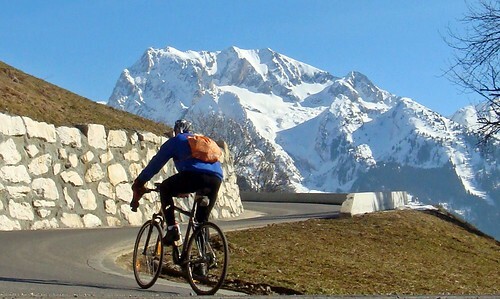 The highest Cols usually open the first week in June or the last couple of weeks in May. Galibier may be open earlier in 2013 since it is scheduled to appear in the Giro in late May. And of course the lower stuff usually opens earlier. The dates are never firm but you can usually contact the local tourist offices and ask when it is getting close (late May). It is definitely quieter to travel in June or September. And usually the highest stuff is open will into October or even occasionally November, although large amounts of snow and closures are definitely possible as Sept ends and autumn kicks in. The ski station roads like La Plagne, Alpe d’Huez, etc will stay open all year. Although most won’t usually be suitable for a road bike in winter. Me and my freind will attempt to approach the Alps from the north, probably out of Munich. What is the best route to take, heading for Rome in June. Our Equipment are loaded tour bikes, no crew. Sorry, I don’t know the Alps that far east. Although if you come through Eastern Switzerland you could enter Italy via Umbrail pass and Stelvio …. which would be quite awesome. Will , great site which has been most helpful in planning our ride. Four of us cycling from UK (into Cherbourg) to Turin for charity, so passing the alps has been a key planning challenge. Starting mid May for two weeks. We appreciate some of the passes may not be open but a couple of questions… Is the tunnel opposite the lake from Aix, down to the lake OK for cyclists? From Chambery airport how would you route to Albertville? Same from Albertville to Bourg St Maurice? Four of us in reasonable shape (by then!!) but looking to avoid extremes – total of 740 miles but have planned 40 miles each day for the big climb days. Thanks for your help and keep up the great blog..
1. Aix in Provence or Aix-les-Bains? 2. Chambery to Albertville? It depends if you want an easy way or a mountainous way. Easy way would be to just take the main road directly D1006 / N6. It will be busy leaving Chambery. I don’t know the direction of your Tour but Annecy to Albertville is far better cycling than Annecy to Chambery to Albertville. There is a car-free bike path virtually the entire route between Annecy and Albertville. 3. Albertville to Bourg St Maurice? Take Albertville to Beaufort, then climb Cormet de Roselend and descend down to Bourg St Maurice. Beautiful, although a big climb. It’s well signed. Taking the down-low option via Moutiers on medium busy, fast roads and includes a mandatory, nasty, long tunnel past Moutiers (there is a bike lane though). Hope that helps, happy to try and answer follow-up questions. Aix le bains – looks to be road number 1504… Down the mountain to the Lake via a tunnel. The route for our trip is, in outline, Cherbourg, Orleans, Loire valley to Digoin, Airport Chambery to Nr Albertville, Bourg St maurice up and down to Turin! 12 days in total. Our debate is whether to go North East out of Chambery over the high ground to Lake Annecy and then on to Albertville or the Southern route you mentioned. The second element of this debate is not to stop at Albertville at all but keep going to Beaufort. ?Thus ready for the next day to Bourg. All stops are booked except the Albertville / Beaufort. Averaging 65 miles a day as a target but obviously we have varied that around the terrain. Any comments on the tunnel or the route to or past Albertville would be appreciated. 1. The Tunnel du Chat D1504 is forbidden to cyclists. You can go over it via the D914A. 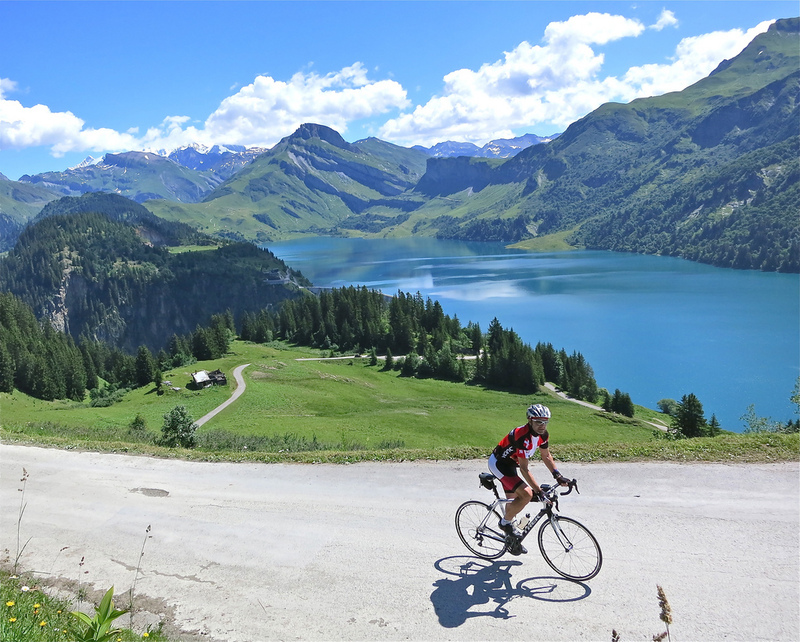 The high point is Col du Chat — a very pretty little climb that overlooks the lake. High point is just over 600 metres. It’s a popular cyclist route. If you wanted to not do the climb, you would have to come at the Lake from further north eg Culoz and head dead south on the east side. Much less nice …. but flat. 2. Glad to hear you are heading to Bourg St Maurice via Beaufort. It’s a stunning route. 3. From Aix/Chambery, I suppose the easiest direct mountainous way to head to Albertville via Lake Annecy would be by either the D912 (Via Col de Plainpalais) or the D911 and then the D912, you’d then cross Col de Leschaux (900 metres) at LEschaux and then descend towards Lake Annecy. I am pretty sure the D912 from Chambery to Col de Plainpalais will bein the 2013 Tour de France. You’d continue on to Annecy, while the Tour guys will head higher to Mont Revard. Last question; given the choice, would you route from Chambery to Beaufort via the Southern flatter route or take the mountainous route you outlined?Remembering we will be on day 9 but still looking to enjoy the scenery! We are looking forward to it. The problem at the moment is getting out to train in this weather…. Lot’s of gym time instead. Another top tip- Take insect repellent! Got some nasty fly nips as I climbed, not that I noticed over the exertion. There are also mosquitos around at night in the summer in the Alps. If anyone is still wondering about gearing, before my Alpine trip I regarded myself as a well trained cyclist, could easily scoot up the local Oxfordshire and Welsh ‘big climbs’ in my 25t rear, 34 front. V glad I had a 27t rear cassette fitted, even then there were times I could have done with a 28t or even a 30t, just to change the load from muscular to CV system by spinning the legs faster. Don’t underestimate how long some of the climbs are- think 2 hrs at over 8% on some of the giants like Madeleine or Galibier, its not big or clever to be grinding away in a big gear, even the pros like to spin now.